Hello, again! Its been a whirlwind around Dynamo central since the finish of the Kickstarter, coordinating all the little bits and pieces needed to keep this running and get all these parts in your hands for October. Many of you should have started to receive your pledge surveys which let you select all your goodies. We've sent email surveys for pledges up to the $50 level, so far, but we plan to have the rest ($75-500 pledge levels) out to the rest of you by end of next week (Aug 2nd). The survey tool isn't quite state-of-the-art, so we have to make one generic survey for each pledge ($) level. The surveys are very quick to fill out, so take a look to see if they are buried in your email and please fill them out on the spot if you are able. **NOTE**- If you have any add-ons beyond the dollar value of your pledge (for additional kits- Moli modifiers, Chris kits, international shipping, etc), we will be contacting you directly for specific questions about your orders. We have contacted many of you already, but keep an eye out for emails from us via Kickstarter. We're making some final adjustments to the part molds to ensure that the Mo figure is a high-quality, durable product. 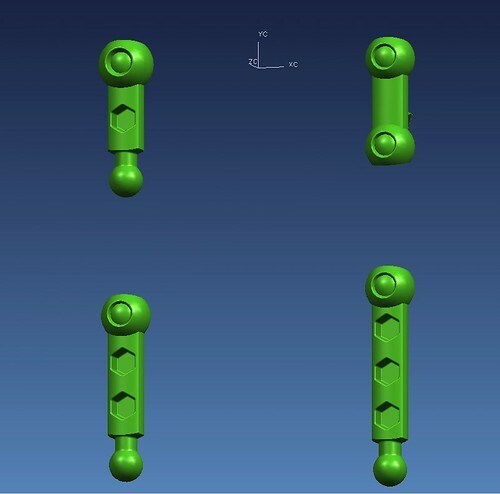 Below is a pic of some modifications we are making to the arm/legs parts where we had been getting some hairline fractures in the sockets, causing them to loosen over time. We've closed the hole in the socket to make it stronger. Rest assured that we'll keep at it until its fixed. 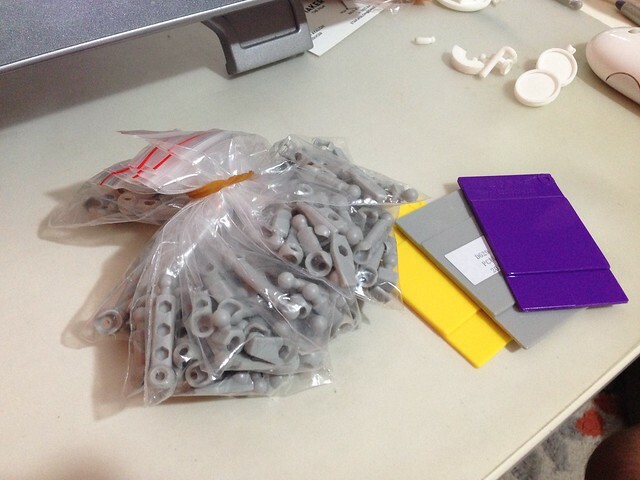 We got some great looking gray parts and color chips for the three new colors- gray, purple, and yellow. We approved the color ships and committed to final numbers for production. They will begin manufacturing the Mo figures starting this tuesday, July 30th and production will finish on or around August 26th. We're still working out the details of shipping the items to the US, but we have plenty of options on the table including a much quicker airship option. This will give us plenty of extra Mo figure kits to cover any additional requests before Christmas. That's all for now, but we will be getting back to you next week with some pics of some newly updated 3d printed parts for Bravest Warriors Chris figures, Moli Modifier parts and the new Moli chestplate and belt. If any of you have questions about adding some items to your order, feel free to contact us directly using the 'Contact Me' button on the main Kickstarter page or at Mo@modibot.com. The one exception is Bravest Warriors Chris kit. He was an exclusive offer available only for the duration of our campaign. As always, thanks for all the help and support! The information collection has been really smooth and its been great to trade emails with many of you! I'm sure that a number of people would like to buy the Creature kit. I want one. Other people will want the other 2 kits. If a good enough combo price is available I'll buy the three of them. I'm not talking about Kickstarter pledging. I mean real regular store transactions. If the files (STL) are for sale, I am interested in them. Some of your examples of accessories on Shape are clear green. I want to do some glow in the dark stuff. And UV reactive. Was picking out what hero packs I was interested in, the video with all the sets is quite helpful to that end. But the color combinations are a bit harder to estimate as there are not image for all the colors and the color square is only estimated comparison of colors instead of actual. For example the red body is brighter than the list of colors would have me believe. I know you don't yet have figures created in all the colors but, as pictured in this update, do you have color chips for all the body and accessory colors that could be lined up to show the contrast between the colors to help pick what mix of body and accessory colors I prefer?